"Amanda Foody pulls you into the smoky world of Gomorrah, where undying fires fueled by the souls of the dead light the traveling festival. In this den of assassins, thieves, and entertainers, we find an illusionist with the power to turn her imaginings into flesh and bone. She has constructed herself a family of these illusions and when the impossible happens and one of them is murdered, her world begins to splinter apart as she frantically searches for the villain who is systematically killing off her family. Truths are never simple though and she is tumbled into a world of political intrigue few know of, where the boy she shouldn’t trust seems her only ally. Foody does the remarkable task of weaving an unpredictable tale that readers can try to figure out but won’t until she decides to let you in on the secret. 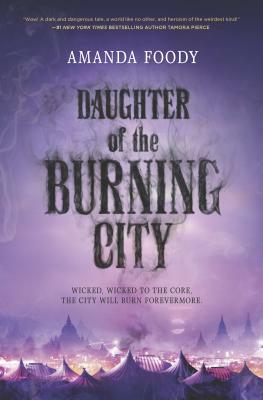 Daughter of the Burning City contains unique characters not frequently seen in its genre thrown into a world of magic, murder, and self-discovery." A darkly irresistible new fantasy set in the infamous Gomorrah Festival, a traveling carnival of debauchery that caters to the strangest of dreams and desiresSixteen-year-old Sorina has spent most of her life within the smoldering borders of the Gomorrah Festival. Yet even among the many unusual members of the traveling circus-city, Sorina stands apart as the only illusion-worker born in hundreds of years. This rare talent allows her to create illusions that others can see, feel and touch, with personalities all their own. Her creations are her family, and together they make up the cast of the Festival's Freak Show.But no matter how lifelike they may seem, her illusions are still just that--illusions, and not truly real. Or so she always believed...until one of them is murdered.Desperate to protect her family, Sorina must track down the culprit and determine how they killed a person who doesn't actually exist. Her search for answers leads her to the self-proclaimed gossip-worker Luca. Their investigation sends them through a haze of political turmoil and forbidden romance, and into the most sinister corners of the Festival. But as the killer continues murdering Sorina's illusions one by one, she must unravel the horrifying truth before all her loved ones disappear.